If you eat meat, creating a big pot of Bone Broth is an ideal way to create a nutrient rich food-medicine, reduce waste, and really share your gratitude for the animal that brought you that meat. It’s also a fabulous way to utilize veggie scraps such as carrot peels, celery ends, onion skin and ends, etc. Showing respect and gratitude for all that we consume allows us to see deeper into how and what our consumer decisions impact. Eating meat in the construct of how it is normally available, i.e. mass agriculture, unfit conditions, and degradation of the land, makes it difficult to consume without guilt. And yet, I find it problematic to shame others into eating a completely plant based diet, or only eating meat raised on a small scale farm only available for purchase during farmer’s market hours on a Saturday. For many people, those ways of living are inaccessible. I personally have tried to be vegan, and vegetarian, but it simply did not work for me. I’ve learned to make better choices, when I have the ability to, and how to utilize parts of the animal that to most, seem undesirable. For example, chicken feet stock is a great protein, glucosamine + collagen rich broth that is affordable without placing demand on chicken meat. What I mean is, chicken feet are inexpensive because they are viewed as a by-product of processing chickens for their meat. They make a delicious broth. Beef Bones are another example. Ox-tail, Leg Bones, Knuckles, etc. are often packed in freezer sections of grocery stores. If there is a butcher at your local grocery store, you can ask the butcher to package bones for you. Having lived in 4 different locations (Philadelphia, Los Angeles, 29 Palms + Maurice) while making bone broth during winters, I can say that every grocery store (that I’ve had the pleasure of shopping at) can and will provide bones for you if you ask. Most grocery stores have bones readily available for very cheap. Of course if you have access to a small scale farm, those bones will be more nutrient dense as a result of their healthier diets and environments. Beef and Pork bone broth have a more robust flavor, but isn’t as mineral rich as chicken, so we utilize Apple Cider Vinegar help leech minerals from the bones, and add ample vegetables. The difference between Bone Broth, Broth and Stock are as follows. Broth: the liquid produced when you simmer meat with water, takes only a few hours to make, and is a thinner liquid. Stock: the liquid produced when your simmer bones with water, takes longer to extract stock, say 3-4 hours for poultry, 6-8 for pork or beef. Bone Broth: the liquid produced when you simmer bones with water for an extended period of time, takes one and a half to two days to simmer or until bones crumble under pressure. Why Bone Broth? It provides more protein and nutrients than a stock or broth, by extracting all the potential of the bones. Therefore, it eliminates the most waste. Filled with gelatin, bone broth is fuller, silkier and more flavorful than a stock or broth. I typically just freeze all of the bones from any meat I cook, and throw into a pot when I am ready. I like to work in big batches, and freeze for later. I am going to provide 2 basic guidelines for making bone broth, one method for uncooked bones + one for cooked bones. Vegetable Scraps: use typical soup vegetables. Mushroom, Onion, Carrot, Celery etc. Buy enough bones to fill a baking tray. Try mixing Knuckle bones, Marrow bones, or any other readily available bones. Roast Beef Bones at 400 degrees for 45 min- 1 hour, or until they start to brown and any marrow pulls away from the bone. Transfer to a large stock pot or crock pot, and pour 1/4 cup - 1/3 cup (use your intuition here: more bones, more vinegar) apple cider vinegar on top of bones. Fill pot with water until 2-3 inches over bones. Cover and simmer for minimum 12 hours up to 24. Add water as necessary to keep bones submerged. I like to simmer as long as possible, and you can definitely note a difference in flavor between 12 and 24 hours. NOTE: when you add water, feel free to add a few stalks of celery, carrot and an onion chopped in quarters. I like to add garlic when I’m feeling a bit run down. Burdock root is a nutritive addition that helps stimulate lymphatic system, and is a delicious pre-biotic. I love it in my soups. You can separate bones by type, i.e. all poultry together, pork, and beef. Or feel free to use together for a dynamic flavor. Since you’ve been saving your bones from meals now ;) ;), add those into your large stock pot or crock pot. Cover with water until you reach 2-3 inches above bones. If you plan to add vegetables, do so now. Use the guide below to determine how long to cook your bones for. If using a mix of all three, try to find a sweet spot in the middle. My supply of bone broth, stock + gumbo broth! 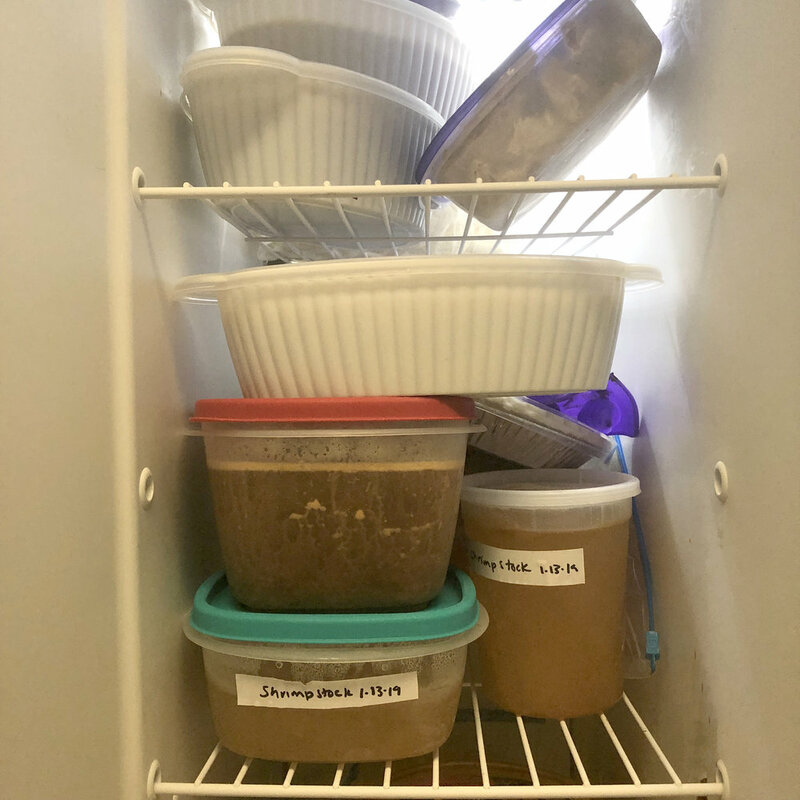 If you are not using bone broth right away, store in an airtight container in your fridge so you can sip on mug fulls of it through the week, or add to a dish later that week. If you don’t intend to use within the week, add it to your freezer (leave headspace if using a glass jar) and use within 6 months.